When planting cilantro, you can sow the seeds directly in the garden or full-sized container. The plants grow relatively quickly and can tolerate light frosts. If you live in an area that has a short spring, you can start the seeds in peat pots and then set the pots in the garden a couple of weeks before the last expected frost in your area. Cilantro plants have sensitive root systems that don't like to be disturbed. If you try to start the seeds in plastic pots, expect a high failure rate after transplanting. Peat pots are a much better alternative because you don't have to remove the seedling from the pot before transplanting it. The whole pot can be planted in the ground and will break down over time. Additionally, peat pots have nutrients in them that will help the seedlings to grow. If you want to plant cilantro seeds in peat pots, they can be purchased at your local garden center. Fill the pots with good quality topsoil or potting mix and plant 2 seeds in each pot, about 1/4 inch deep. Cover the seeds with soil and water them in well. They take 7-10 days to germinate. Once the seedlings emerge, thin to one plant per pot. When the plants are a couple of inches tall, they can be transplanted into the garden. Before planting the peat pots, make sure the soil is tilled well to a depth of at least 6 inches. Use a trowel and dig a hole slightly wider and deeper than the peat pot. Place the peat pot in the hole and backfill with dirt. 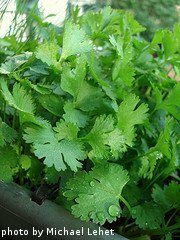 After planting cilantro, lightly tamp down the soil around the plant and water it in well. 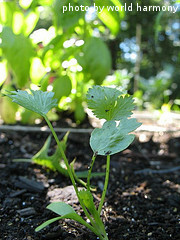 Cilantro seeds can be sowed directly in the garden beginning about 4 weeks before the last expected frost in your area. Make sure the soil is tilled to a depth of 6 inches. Use a hoe to create a shallow row, 1/4 inch deep. Scatter the seeds in the row, spacing them 6 inches apart. If planting more than one row, space the rows at least 1 foot apart. After planting the seeds, cover them with soil and tamp it down lightly before watering them in. To have fresh cilantro all summer long, plant seeds in the garden every 2-3 weeks. This way, as the first plants begin to turn to seed, the younger plants will be ready to harvest. 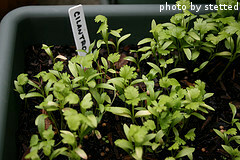 To plant a fall cilantro crop, sow the seeds 6-8 weeks before the first expected fall frost in your area. This will give the plants enough time to develop enough leaves that can be harvested before the cold weather sets in. If planting cilantro in the fall, there usually isn't enough time for the plant to develop seed pods before a cold snap kills the plants. If you want to grow cilantro in a container, follow the directions listed above. Choose a container that is at least 8 inches deep and 16 inches across. Make sure there are holes in the bottom of the container for adequate drainage. Evenly space 3-4 seeds in the pot, planting them 1/4 inch deep. Cover the seeds with loose soil and water them in well. When the seedlings are a couple of inches tall, thin plants so they are spaced 6 inches apart. Now that you know about planting cilantro, it's time to think about watering and fertilizing your cilantro plants.